(Nanowerk News) Using the same baking soda found in most grocery stores, Lawrence Livermore scientists, along with colleagues from Harvard University and the University of Illinois at Urbana-Champaign, have created a significant advance in carbon dioxide capture. To date, microcapsules have been used for controlled delivery and release (e.g., pharmaceuticals, food flavoring, cosmetics, agriculture, etc.) -- but this is the first demonstration of using this approach for controlled CO2 capture and release. The aim of carbon capture is to prevent the release of large quantities of CO2 -- a greenhouse gas that traps heat and makes the planet warmer -- into the atmosphere from fossil fuel use in power generation and other industries. However, currently used methods, while successful, can be harmful to the environment. The ability to move away from caustic fluids, such as monoethanol amine to capture CO2, to more environmentally benign ones, like carbonates, is a key attribute of the team's research. "Our method is a huge improvement in terms of environmental impacts because we are able to use simple baking soda - present in every kitchen - as the active chemical," said Roger Aines, one of the Lawrence Livermore team members. "Corrosiveness also is improved because the chemical is more benign and always is encapsulated. Putting the carbonate solution inside of the capsules allows it to be used for CO2 capture without making direct contact with the surface of equipment in the power plant, as well as being able to move it between absorption and release towers easily, even when it absorbs so much CO2 that it solidifies." Unlike more caustic sorbents used in capturing CO2, the microcapsules only react with the gas of interest (in this case CO2). "Encapsulation allows you to combine the advantages of solid capture media and liquid capture media in the same platform," said Jennifer Lewis of Harvard School of Engineering and Applied Sciences, and key author of a paper appearing in the Feb. 5 edition of the journal, Nature Communications ("Encapsulated liquid sorbents for carbon dioxide capture"). Encapsulation also dramatically increases absorption compared to traditional carbon capture techniques. "It's all about surface area," Aines said. "The capsules force the baking soda to stay in little tiny droplets (an order of magnitude smaller than a drop of amines would take on) and little drops react faster because they contact more of the CO2." Aines said this will require a new kind of capture process, which Livermore is working on with the National Energy Technology Laboratory (NETL). 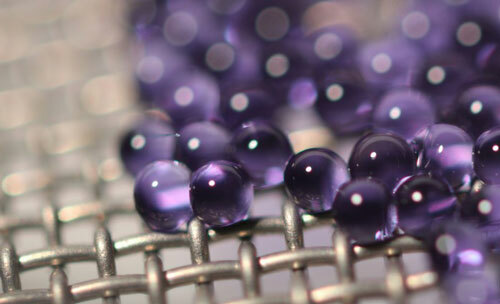 The encapsulation process was developed as one of the Department of Energy's inaugural Advanced Research Projects Agency-Energy (ARPA-E) innovative carbon capture projects. The new process can be designed to work with coal or natural gas-fired power plants, as well as in industrial processes like steel and cement production. The technique is not a short-term solution to carbon capture, but a broad, sustainable approach. The sodium carbonate used in the process is mined domestically, rather than being made in a complex chemical process like the current technology (amines). In addition, baking soda has no recycling or degradation issues. "It can be reused forever, while amines break down in a period of months to years," Aines said. "We think the microcapsule technology provides a new way to make carbon capture efficient with fewer environmental issues," he said. "Capturing the world's carbon emissions is a huge task. We need technology that can be applied to many kinds of carbon dioxide sources with the public's full confidence in its safety and sustainability."